Muslim shooting: It’s the guns, stupid! Whether a gun killing is a hate crime or not– whether it is perpetrated by a disturbed young man at an elementary school, an overzealous neighborhood watchman, a panicky police officer, or an angry, confrontational neighbor– it is an atrocity that shouldn’t be going on in any decent human community in any civilized country. The latest weapons tragedy involves the killing of three Muslim- American students at the University of North Carolina at Chapel Hill. Deah Shaddy Barakat, 23, his wife, Yusor Mohammad, 21, and her sister, Razan Mohammad Abu-Salha, 19, were exemplary students; all were involved in humanitarian projects. The young women wore hijab, head scarves and clothing that covered their bodies, a Muslim symbol of modesty and privacy. Craig Stephen Hicks, 46, their neighbor and suspected killer, was studying to be a paralegal at a technical college and described himself as a “gun toting” atheist. He’d had disputes with them over parking issues and exposed his gun during one confrontation. Tuesday evening he killed each with a bullet shot to the head, according to police. Hate crime, the victims families say. Mohammad Abu-Salha, father of the two sisters, said one of his daughters said Hicks was harassing them because of their obvious Muslim faith. And their deaths immediately raised the question of whether the students had been targeted because of their religion. Only when the young women moved in did Hicks start to complain. And echoing the language used to protest shootings of African Americans in the U.S., Muslims around the world took to social media with the hashtag#MuslimLivesMatter. The Muslim Public Affairs Council, the Council on American-Islamic Relations (CAIR) and the local Raleigh-based Muslims for Social Justice called for a federal investigation into possible hate crimes. Not so, says Hicks wife, who is suing him for divorce; it had nothing to do with hate, she said noting he was an atheist; it was merely a conflict about the parking spot. “We understand the concerns about the possibility that this was hate-motivated, and we will exhaust every lead to determine if that is the case,” said Chris Blue, Chapel Hill police chief. Isolated incident crime? Hate crime? Religious bias crime? Parking space issue crime? Hicks killed them, but he didn’t hate them? We’re stuck in definitions here when it’s really all about the guns, the easy access to them, their glorification and a gun manufacturing industry that owns the Second Amendment. If Hicks hadn’t had a gun, couldn’t easily have gotten a gun, his anger issues had been dealth with, he might have used his fists, a knife or nasty words, but there wouldn’t be three people now dead execution style. A point that Australia got back in 1996 when an unstable young man gunned down dozens of people at a popular tourist destination, Port Arthur, Tasmania. Australia has a frontier history and a strong gun culture just like the United States, but in less than four months of the tragedy, Australia passed The National Firearms Agreement. The sweeping gun reform program, passed by conservatives, included the world’s biggest buyback and destruction of nearly 700,000 guns, requires justification for owning a weapon, a waiting period, registration, no internet gun or garage sales, and a license renewal every two years. One Australian farmer who had been strongly against the reform said told John Oliver of The Daily Show with Jon Stewart in the segment Australia and Gun Control, that his opposition was “an overreaction…the regulations were quite manageable” He said that he had a bit of a duty to the rest of society” to support gun reform. Have the flowers, candlelit vigils, masses of teddy bears and other plush toys on the sidewalk, speeches for the media, but vow to commit to change America’s gun laws. Karen Dewitt. You must be suffering from hoplophobia. Good news is that it is a treatable condition. Just visit a specialist. 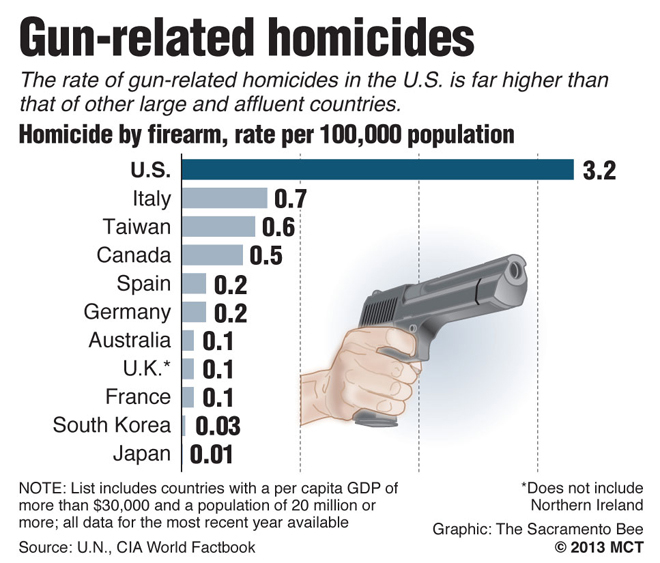 “It’s the guns” Wrong…. If you take out the killings happening in the hands of democrats in the top 10 murder capitals in the country (all of them also lead by democrats), the US goes from #1 in firearm death to #111. The problem is clear. it is not guns. The problem is Democrats owning guns. Did you know that 75% of all felons are democrats (US Census). Ban democrats from owning guns and problem solved. This guy wasn’t just any liberal, he really really hated Christians and any conservatives. I wonder how they’ll charge him with a hate crime? He can’t possibly be racist, being a good progressive Obama voter. Notice how the ‘gun toting’ is in quotes but the ‘atheist’ isn’t? That’s because the full quote from his social media posting was terming himself a ‘gun toting liberal.’ They don’t like to post that fact, because it doesn’t jive with the narrative that this guy was some right wing hillbilly. He liked to vote democrat, and show off his gun. Ban all liberal democrats from owning firearms, they will clearly kill anyone who upsets them. Not the kind of people you want around guns. Barack Obama calls this Domestic Terrorism. But when an Islamic Nutjob Muslim is killing in this country he drops any reference to Terrorism and calls it violence. Like the Fort Hood Shooting. That Islamic Nut was yelling Allah Akbar while he shot and killed numerous American Soldiers. He called that Work Place Violence. Or that woman beheaded in Oklahoma by another Islamic Nut while at work was yelling Allah Akbar while he cut her head off. That too Obama and Holder Classified as work place violence. Obama would never want to betray his beloved Muslim brothers. Just look at how he sat on his hands while ISIS took over the middle east… and then squandered all gains from Iraq and Afghanistan. He has destroyed our foreign policy. He has ruined our country. Stateside, Obama has crippled our economy. Everybody I know is either out of work or under-employed. And our expenses keep rising. My health insurance is now up to $400/month. Before the government touched it, it was $250/month! My auto insurance, which the government has yet to ruin, is thankfully only $24/month (from Insurance Panda). Please, Obama! Don’t try to socialize ANYTHING ELSE! With everything Obama touches now in shambles, Barry needs a new hobby. When is he going to wake up? When is America and the rest of the world going to wake up? Islamic extremists need to be eliminated… and for that to happen in the west, Islam needs to be confined to the Middle East. In all its senseless killing but our tool President makes Damn sure it won’t make him or his administration look bad so he reclassifies it. I love how people are crowing over this, suddenly Muslim lives matter. Did they matter when Zemir Begic had his skull beaten in with hammers during the Mike Brown riots? Maybe just forbid the left from owning firearms. Most would kill anyone who upsets them given the chance, and that is not the kind of mentality needed for responsible firearm use. You don’t pluralize with an apostrophe. Correct, Russ. But you also need a comma after guns. Thanks for pointing it out. So move to Australia and leave the US citizens’ rights alone. Somewhere between 80,000 and 2 million people use firearms in their own defense each year. The gun control utopia UK that anti rights people like you keep bellowing about has about a 5X greater violent crime rate than the US. That means you’re one hell of a lot more likely to be raped in the UK than here. According to you that would be acceptable as long as they didn’t use a gun to do it, I guess. Hey look an intelligent person on the internet. I love how gun crimes keep going down but media coverage had tripled or more. Fascinating.